The announcement says that based on innovative algorithms and leveraging artificial intelligence, sPrint One makes the planning of print jobs a snap, combining capacity planning and sheet optimisation. The launch of the new Prinergy offering, called ‘Dynamic Print Planning,’ is the result of a strategic partnership of Kodak and PerfectPattern that began in the middle of last year. 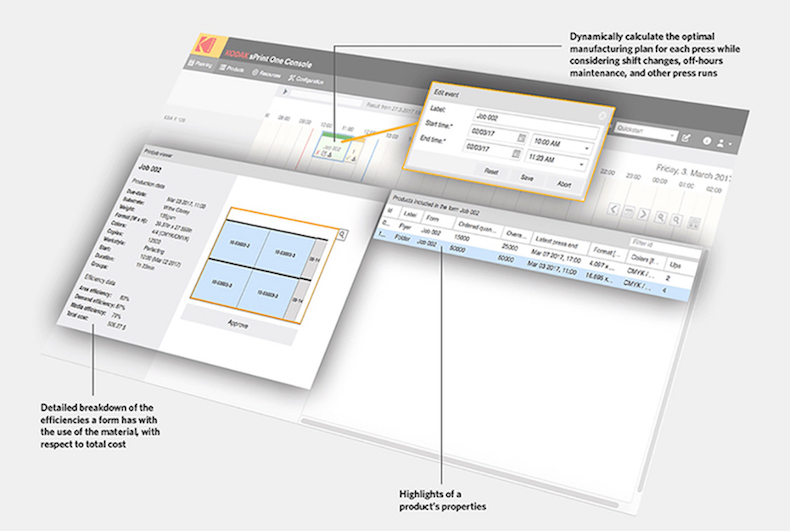 sPrint One's aims to automate the production of a detailed manufacturing plan and a cost optimized set of print ready production layouts, which is now integrated into the Prinergy workflow. The system takes into account all factors likely to influence the outcome as well as the complexity of their relationships – including the printing machines in use as well as the materials, colours, costs and deadlines. According to Meissner, sPrint One makes it very easy and efficient to calculate large job pools. It also provides the flexibility to respond quickly to changing production requirements. “The industry is moving toward smaller, more frequent print runs which create margin and delivery challenges for print service providers,” said Allan Brown, vice president and general manager of Kodak’s Unified Workflow Solutions.